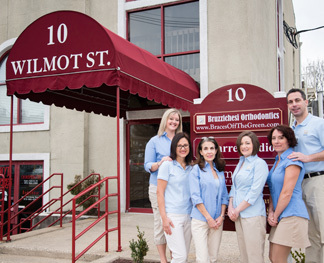 At Bruzzichesi Orthodontics, we have an orthodontist Morristown NJ patients trust. Dr. Robert J. Bruzzichesi offers orthodontic treatments to all ages of patients, including young children who have their first permanent teeth, teenagers who are growing rapidly and adults who were unable to have treatment at a younger age. With modern orthodontic treatment, it is possible to fix mild to severe malocclusions faster. The best time to visit an orthodontist is during early childhood before the facial bones harden, but it is never too late to improve your smile. Repairing misaligned teeth can improve a patient’s overall well-being by increasing her self-esteem and making it easier to chew nutritious foods. With teeth that have the proper spacing, a patient can talk better, and he is less likely to develop temporomandibular joint dysfunction. Dr. Bruzzichesi believes in taking care of the whole patient, and that is why he keeps a lower volume of patients than many other orthodontists do. He wants to provide individualized care for his patients by taking more time to learn about their dental health so that he can provide the best orthodontic treatment. Our orthodontist enjoys the science of orthodontics and wants to help his patients have a unique smile that looks fantastic with their facial features. Customer service at Bruzzichesi Orthodontics is vitally important to our team, and our orthodontist has hand selected each team member. We have a valuable office team that includes a front desk manager and financial coordinator. Our back office team includes a treatment coordinator, clinical coordinator and registered dental assistant. When a patient visits our orthodontic facility, she will have an opportunity to meet each team member. We have a state-of-the-art orthodontic facility that includes a waiting area, examination rooms and diagnostic areas. You can walk through our orthodontic facility to see the different areas and equipment. In order to have treatment with braces, aligners or retainers, we collect medical images of our patient’s mouths, teeth and facial areas. These X-rays are ready within minutes, and our patients can see what their teeth or facial bones look like to understand why orthodontic treatment is necessary. Our orthodontic facility believes in giving back to the community, and our patients can select a sports team, club or charity that will receive a $50 donation after they begin to wear braces. Not only do we believe in financial donations, but also, we enjoy reaching out to the community to teach the public about proper dental hygiene and orthodontic care. Our patients also enjoy rewards during their visits, including winning prizes in contests. Why Do Some Individuals Need Aligners or Braces? An examination by Dr. Bruzzichezi can reveal one or more types of malocclusions that will require treatment with removable aligners or braces. In some cases, our patients need other types of treatments such as surgery, headgear or a retainer. What Are the Signs That Someone Needs Braces? With X-rays, our orthodontist will understand what types of malocclusions a patient has to choose the most appropriate variety of orthodontic treatment. With an examination and medical images, Dr. Bruzzichesi can determine if a patient needs treatment with braces or aligners. Young children are not able to wear aligners because they grow too rapidly for the devices to fit properly, and the items are considered a choking hazard for them. However, teenagers and adults with mild to moderate malocclusions are able to wear aligners. For treatment from the best Invisalign Dentist Morristown NJ residents trust, make sure to call us at Bruzzichesi Orthodontics. How Are Invisalign Aligners Created For a Patient’s Teeth? Invisalign aligners are a newer type of orthodontic treatment option that has permitted more patients to have their teeth straightened. Patients like wearing these removable devices because it is easier to consume food, drink beverages or perform oral hygiene. However, our patients must wear the devices as much as possible to have the best results. Our patients can wear aligners while they are drinking plain water, but they should remove the devices while eating food or drinking other types of beverages. Aligners are created using a patient’s dental X-rays along with molds of the upper and lower teeth. How Do Invisalign Aligners Adjust Our Patient’s Teeth? Plastic aligners are designed to fit firmly over a patient’s teeth, but a set of these aligners will degrade in approximately two weeks. As a set of aligners degrades, a patient will change to a new set that has a slightly different configuration. These differences in configuration will apply gentle pressure against the misaligned teeth to push the teeth into the proper position. The process of treatment with aligners requires six months to two years when the patient follows our orthodontist’s protocols. By the time that a patient has completed treatment with Invisalign aligners, he will wear 20 to 25 sets of the devices. While undergoing treatment with aligners, a patient will bring in an old set so that our orthodontist can examine the devices. If an aligner is uncomfortable or has unusual signs of wear, then we can collect a new mold to create better aligners for the patient. When a patient first receives aligners, the items will feel strange, and some patients create excess saliva. It is essential for our patients to consume a healthy diet while undergoing treatment with aligners to avoid bone loss or tooth decay. Optimally, our patients will wear their aligners for a minimum of 20 hours a day and night. The best way to keep plastic aligners in excellent condition is by removing the items while eating food or drinking beverages. After finishing a meal or snack, our patients should brush and floss their teeth. Patients must clean their aligners by rinsing the devices in cool water and brushing the items with a soft toothbrush. We recommend certain brands of toothpaste and mouth rinses that don’t have artificial dyes that will stain the plastic aligners. We provide protective trays for our patients’ plastic aligners to keep the items in when they are eating or performing oral hygiene. Children can’t wear aligners, so Dr. Bruzzichesi recommends traditional metallic braces for these patients. Braces with metal brackets and wires are also an affordable option for teenagers or adults who have moderate to severe malocclusions. Today, metallic braces are designed with modern computer software, making the devices more effective than in the past. In addition, the metal brackets are smaller and less noticeable. Treatment with these braces can last up to four years, but most patients only need the devices for two to three years. When our patients don’t want other people seeing their braces, our orthodontist can apply lingual braces. These types of braces are placed on the backs of the teeth, making the devices difficult to see. Dr. Bruzzichesi uses the In-Ovation brand of lingual braces that are also self-ligating. With self-ligating braces, our patients won’t need to use elastics or ties that break. Lingual braces will cost more, but the devices are popular with adults who want to hide their orthodontic treatment from others. The brackets of lingual braces that are worn on the backs of the teeth won’t make calcification marks on a patient’s tooth enamel. Ceramic braces will have clear brackets, or an orthodontist can design brackets that match the color of a patient’s teeth. Our orthodontist prefers clear brackets because the natural color of a patient’s teeth can change slightly over the course of a two to four year treatment. The brackets of ceramic braces are designed to apply more pressure to a patient’s teeth, and braces are suitable for mild to severe misalignments of the teeth. The wires that hold the arch wire in place are either white or clear, helping to make the braces nearly invisible in a patient’s mouth. When a patient has an overbite, Dr. Bruzzichesi will recommend a Herbst appliance to correct the growth of the lower jawbone. This orthodontic appliance is combined with braces to correct a patient’s severe malocclusions. A Herbst appliance applies additional pressure on the lower jaw, and it is typically designed for younger children who have softer rapidly growing bone. While wearing this type of dental appliance, a child, teenager or adult must maintain his oral hygiene carefully to avoid developing bad breath or gum disease. While some patients have jaw problems that require correction, others need to have their palates expanded to a larger size. A palatal expander is designed for correcting the size of the palate and upper jawbone. Repairing the palate and upper jawbone requires shifting the position of a patient’s teeth along with adjusting the two sections of the palate. The process of expanding the palate lasts four to six months. Most patients who wear palatal expanders are children with softer palates and bone tissue, but occasionally, teenagers or adults will require a palatal expander. Some of Dr. Bruzzichesi’s patients require surgical orthodontic procedures. This can include the removal of extra teeth that are creating a bad dental bite and unattractive smile. In some cases, a patient needs orthodontic surgery to widen her palate or correct the position of the jaw. These types of surgeries are often combined with the appropriate orthodontic appliance. The best time to have surgical orthodontic procedures is during early childhood to correct genetic defects or growth problems. Surgical orthodontia is also used when a patient has a severe injury to the mouth, or when he has a health condition such as a tumor. In some cases, surgical orthodontics is used to correct the problems associated with temporomandibular joint dysfunction. What Is Temporamandibular Joint Dysfunction? Temporomandibular joint dysfunction is a condition that affects the jaw, mouth and teeth. When our patients have this condition, they experience a multitude of symptoms such as headaches, teeth grinding or pain that radiates into the neck and shoulders. Temporomandibular joint dysfunction involves the muscles, joints and bones of the face and skull. This condition typically affects adults, and most patients with temporomandibular joint dysfunction are female. When one of our patients has this condition, it affects her quality of life. How Is Temporomandibular Joint Dysfunction Diagnosed? Our orthodontist understands this complex condition that can include several health problems such as sensitive nerves in the jaw’s joints combined with arthritis. Diagnosing temporomandibular joint disorder isn’t easy because the problem doesn’t always appear on X-rays. In some cases, this condition is caused by a bad bite that leads to poor chewing habits. A patient with this condition may have problems opening her mouth to talk or consume food. A patient with temporomandibular joint dysfunction may have problems sleeping at night, or she may develop migraines overnight, making it impossible to function the next day. What Is the Treatment For Temporomandibular Joint Dysfunction? At Bruzzichesi Orthodontics, it is possible to receive expert treatment for temporomandibular joint dysfunction. The orthodontist Morristown NJ residents recommend for the treatment of temporomandibular joint dysfunction is working at our facility. He knows how to make customized occlusal splints for patients to reduce the pain caused by temporomandibular joint dysfunction. Dr. Bruzzichesi can design hard or soft occlusal splints that will fit over the top or bottom of a patient’s teeth. These devices are similar in appearance to Invisalign aligners, but the devices are more durable. With the proper design, an occlusal splint will protect a patient’s teeth from the damages of bruxism caused by temporamandibular joint dysfunction, but more importantly, the devices will reduce the pain caused by the condition. Why Do Orthodontic Patients Need Retainers? After our patients have orthodontic surgery or when they have completed treatment with braces, Dr. Bruzzichesi will create a retainer device. Retainers are made of plastic and wire materials to hold a patient’s teeth in the correct positions. After a patient’s braces are removed, her teeth will relapse naturally back into the former positions because the muscles and tendons are not receiving any pressure from the brackets or wires. It is possible to have a fixed or removable retainer that is designed in different formats to keep a patient’s teeth from relapsing. Many patients only require removable retainers, and these devices are primarily worn at night while a patient is sleeping. Fixed retainers are bonded to the backs of a patient’s teeth, and these devices can remain in place for many years. Removable retainers are used for approximately one year, but with the proper care, the devices can last up to three years. At Bruzzichesi Orthodontics, we can provide an AcceleDent Aura device for our patients. This dental vibration appliance stimulates a patient’s bone growth and muscle development to reduce his treatment time. Our patients take one of these devices home to use once a day to vibrate their braces with micropulses to increase tooth movement. With AcceleDent Aura treatment, a patient can reduce her treatment time by up to 50 percent with only 20 minutes of use per day. Many of our patients find this a soothing treatment to reduce the discomfort of wearing braces. We recommend bringing children to our orthodontic facility at a young age to begin early treatment. Our orthodontist can correct bad habits such as thumb-sucking or pacifier use so that a child will not have dental abnormalities. With early treatment, it is possible to correct jawbone problems or facial abnormalities that lead to additional orthodontic problems in adulthood. Remember that orthodontic care in early childhood will make it easier for an adult to keep her own teeth in top-notch condition. What Types of Foods Should an Orthodontic Patient Consume? Despite these dietary restrictions, it is important to consume a lot of vegetables and fruits. We recommend chopping fruits and vegetables into tiny pieces to avoid damaging the brackets and wires of braces. Our patients can also cook vegetables or fruits to make the foods softer. It is also important to avoid tough meats that can break the wires on braces, but our patients can eat softer ground meats or eggs to get enough protein each day. We also recommend eating a lot of dairy foods to ingest more calcium to maintain the strength of the facial bones and teeth. When an adult patient missed out on orthodontic treatment during childhood or their teeth have relapsed after treatment, then Dr. Bruzzichesi is ready to help. Approximately, one out of five of our patients are adults who want to improve their smiles and dental bites with orthodontic treatment. In some cases, we have entire family groups seeking treatment at Bruzzichesi Orthodontics. We make it easy to check your appointment times by creating an online patient link. With this link, our patients can check their payments, print receipts and contact us with an email.